Multisolving is by nature a complex process. Here are five important elements to keep in mind. 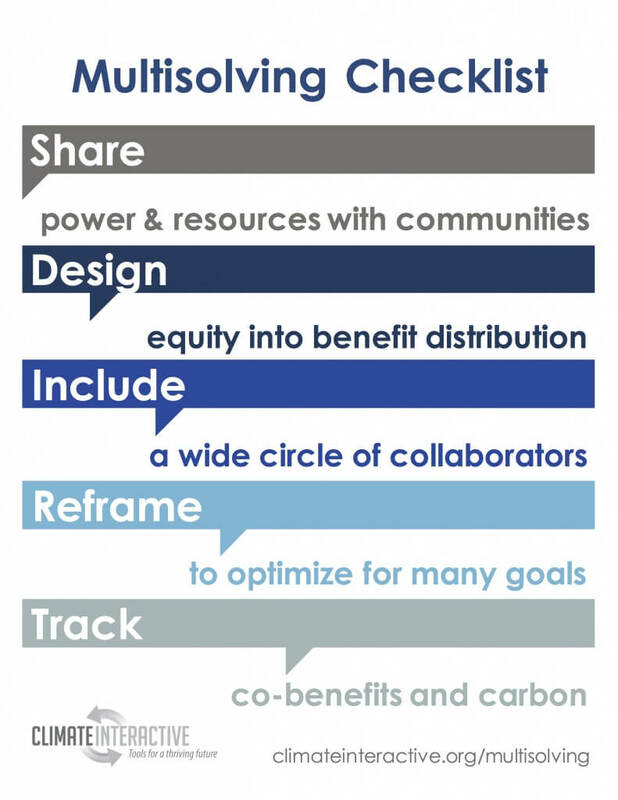 Share power and resources with communities. Policies must fit community needs to be effective, and communities often house critical knowledge needed for a project’s success. Community empowerment is also a way to build lasting change. Include a wide circle of collaborators. Multisolving is not just about multiple benefits; it also requires input from multiple perspectives. Multisolving requires leaders in different fields with different skills and networks to come together to find solutions that no one individual could have discovered or implemented alone. Reframe to optimize for many goals. With many urgent challenges confronting communities and tight budgets to handle them, finding solutions that make progress on several fronts will save money and effort in both the short and long term. Also, focusing on making progress toward one goal alone may cause missed opportunities to make a difference in multiple aspects of people’s lives. Track co-benefits and carbon. Co-benefits often arise more quickly than climate benefits and are more tangible for people. To help your community understand the impact of their efforts, be sure to establish a baseline for factors like jobs, health, and air quality as well as for greenhouse gas emissions, and track changes in both carbon and community benefits over time. For more resources and examples of multisolving, go to our multisolving portal. For questions, or if you think we can help your community multisolve, contact us at multisolving(at)climateinteractive.org.